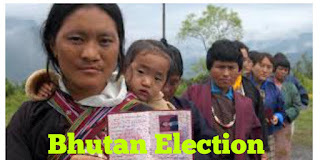 Bhuta election 2018 important facts.Bhutan is landlord country in South Asia. Bhutan is Constitutional monarcy. The government is a parliamentary democracy. The head of state is the king of Bhutan known as the ‘Dragon King‘. Bhutan is a member of the United Nations, SAARC, BIMSTEC and the non-aligned movement. What is Constitutional Monarchy ? A constitutional Monarchy is a monoarchy in which the bmonarchs power are limited by a constitution. Jigme Keshar Nagmyele Wangchuk is the current reigning Druck Gyalpo or “Dragon King” of the kingdom of Bhutan. The parliament of Bhutan is called ”Chi Tshog” and has two houses. National Council (Gyelyong Tshogde) upper house and National Assembly (Tshogdu) Lower house, both with a 5 year term. The National Council has 25 members of which 20 are elected while 5 are nominated by the king. Candidates contest the council election as independent and not as Party nominee. However, election to the national assembly which has 47 members are held party lines. Recently election we’re held in Bhutan DNT party hot 30 seats out of 47 and Lotay Tshering became new Prime Minister of Bhutan. So we hope you all understand abou Bhutan Election 2018. If you like it share to your friends.